An irregular heartbeat, scientifically referred to as an arrhythmia, affects millions of people each year. A person's likelihood of experiencing an irregular heartbeat increases with age. However, there are other factors that can increase a person's likelihood of having an irregular heartbeat and more severe heart problems. Continue reading to learn about what causes irregular heartbeat to get back on track to living a steady life. A woman's emotions have a huge impact on the physical health of her body, including the heart. Any abrupt surge of adrenaline can cause a fast heart rate and cause you heart to flutter, such as when you are feeling nervous, excited, or anxious. Likewise, being stressed out can trigger or contribute to frequent bouts of irregular heartbeat. Emotional state is also what can cause drug abuse and dependency on alcohol and caffeine, which can also cause heart palpitations. Where a person lives and what activities they partake in can also influence their heart health. For example, living in a place with high levels of air pollution can cause irregular heartbeats, especially in those with preexisting heart conditions and the elderly. This is due to the fact that pollution has an inflammatory effect on the heart, leading to chronic issues. Other lifestyle factors that can cause arrhythmia include taking certain nutritional supplements, smoking, and consuming a high-fat diet. There are certain medical conditions that can cause irregular heartbeat. High blood pressure, obesity, diabetes, an underactive or overactive thyroid, sleep apnea, and changes in the heart's structure can all be reasons for having an irregular heartbeat. Dehydration, fever, and other conditions can also contribute to causing a fast heart rate. Ironically, various medications to counteract these irregular heartbeat-causing conditions can worsen the manifestation of irregular heart rate. Furthermore, over-the-counter cold and allergy medications can cause arrhythmias. 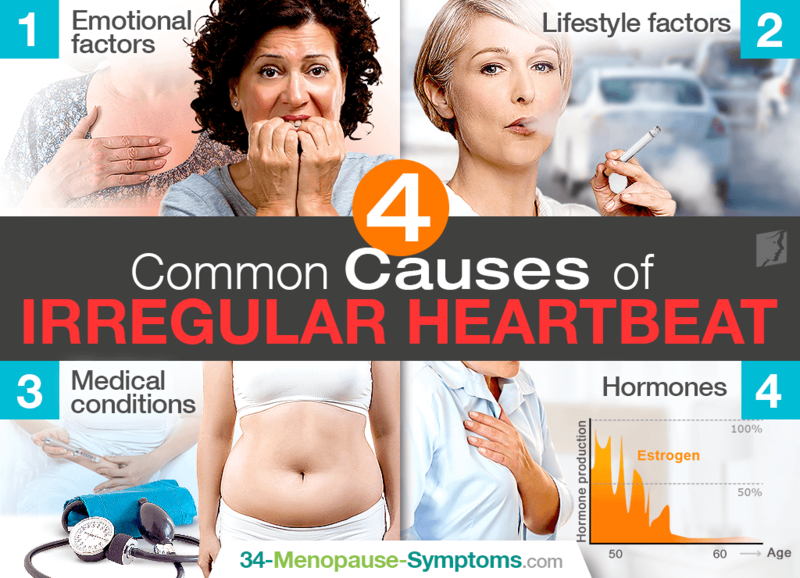 If you are in a phase of your life of drastic hormonal imbalance, such as menopause, then this could be causing heart flutters. This is because estrogen affects the cardiovascular system. In this case, herbal supplements can be a good option as a treatment for irregular heartbeats. Certain hormone-regulating ones, like Macafem, work to nourish the endocrine glands, restoring hormonal balance and ultimately tackling the root cause of the problem. While experiencing an irregular heartbeat can be scary, it is usually not a cause for concern. However, heart rate irregularities can signal a problem if it is accompanied by fatigue, dizziness, lightheadedness, fainting, shortness of breath, or chest pain. If you are experiencing these symptoms along with an irregular heartbeat, it is a good idea to see a doctor. An irregular heartbeat can be a frightening and worrying experience. This article answers some of the most frequently asked questions about this symptom.